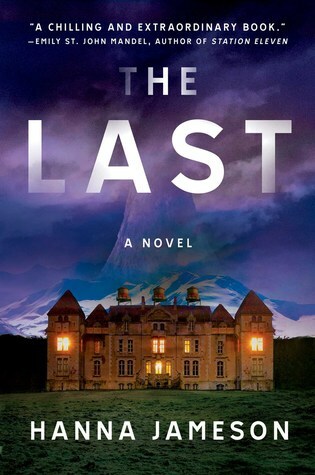 The Last by Hanna Jameson is a highly recommended end-of-the-world psychological thriller. Jon Keller is attending an academic conference at the isolated L’Hotel Sixieme in Switzerland when people begin to receive the notifications of nuclear bombs hitting various cities - Washington D.C., NYC, London, Berlin... As the news outlets and social media explode with the shocking news, they also quickly go silent and it is impossible to contact people. Jon is unable to contact his wife and regrets the harsh words they exchanged before he left for the conference. In the aftermath of the apocalyptic news, many people leave the hotel and try to get to the airport. Others commit suicide, or wander off into the surrounding woods. The clouds are now a strange color. Two months afterwards, Jon is still at the hotel with a small group of twenty survivors comprised of guests and staff. When the water begins to taste off, Jon joins a small group who head up to the water tanks on the roof to investigate. They are shocked to find the body of a young girl in one of the tanks. Jon becomes obsessed with trying to find out who she was, investigate her death, and find the person responsible for it. The chapters are written from Jon's point-of-view and in the form of a sort of journal documenting life in the hotel, including personal stories about the other survivors and their experiences. Jon records his investigation, personal interactions, and stories from the others. The tension rises from the isolation of the group, along with the various personalities and alliances that naturally form with a diverse group of people. Characters Jon interacts with and are his friends are well developed. Naturally they all have secrets. Other characters whose stories Jon records are developed as secondary characters and, perhaps, suspects as the novel progresses. The novel focuses more on the psychological aspects of the situation, which seems very realistic in this isolation scenario, although there are cases of danger when violence is a real possibility. The writing is quite good and the tension increases incrementally. The narrative moves along at an even pace - until the end when it inexplicably ramps up the pace to the point where the denouement feels rushed. This is part of the locked-room genre of novels, with the isolated setting during an apocalypse limiting the number of suspects but also making finding an answer nearly impossible. I liked the ending, despite the rushed aspects of it. There were several instances in some of the interactions between characters when I could definitely tell that the author is British, not American. For example, there was a place in a conversation where Jon said that "...in America we've all been taught this idea that we're descended from rugged self-reliant cowboys." (Ah, no. We're not taught this. Never. Not even a hint of this.) There were also several rather disparaging instances of political commentary. It would have behooved Jameson to leave out some of that which she doesn't actually know as fact. Disclosure: My review copy was courtesy of Atria Books.